(Nanowerk News) The structure of pores found in cell nuclei has been uncovered by a UCL-led team of scientists, revealing how they selectively block certain molecules from entering, protecting genetic material and normal cell functions. The discovery could lead to the development of new drugs against viruses that target the cell nucleus and new ways of delivering gene therapies, say the scientists behind the study. At the heart of every cell in our body is a cell nucleus, a dense structure that contains our DNA. For a cell to function normally, it needs to surround its nucleus with a protective membrane but this must open enough to let vital molecules in and out, so the membrane is pierced by hundreds of tiny gateways known as nuclear pores. The research, published today in Nature Nanotechnology ("Nanoscale stiffness topography reveals structure and mechanics of the transport barrier in intact nuclear pore complexes"), reports on nuclear pores in frog eggs and reveals how these pores can act like a supercharged sieve, filtering molecules by size but also based on chemical properties. Co-lead author Dr Bart Hoogenboom, from the London Centre for Nanotechnology (UCL Mathematics & Physical Sciences), said: "The pores have been known to act like a sieve that could hold back sugar while letting grains of rice fall through at the same time, but it was not clear how they were able to do this." These are nuclear pores imaged by atomic force microscopy, appearing as a craterlike landscape in which each crater corresponds to a pore of ~100 nm diameter. Dr Ariberto Fassati, co-lead author from the Wohl Virion Centre (UCL Infection & Immunity), added: "We found that the proteins in the centre of the pores tangle together just tightly enough to form a barrier, but not too tightly - like a clump of spaghetti. Remarkably, the strands of 'spaghetti' cluster together in a precise way which allows small molecules and salts to flow through without any trouble. Larger molecules, like messenger RNA, can only pass when accompanied by chaperone molecules. These chaperones, called nuclear transport receptors, have the property of lubricating the strands and relaxing the barrier, letting the larger molecules through. This can happen up to several thousand times per second." Before now, scientists understood the overall shape of the pores and that protein structures in the middle of them controlled the flow of molecules, but it was not known how they did this. Some theories suggested the pores acted like a brush and others like a sieve. The researchers behind this study say it was hard to determine which was correct because of the small and fragile nature of the pores and the difficulties in locating the proteins in the pores. 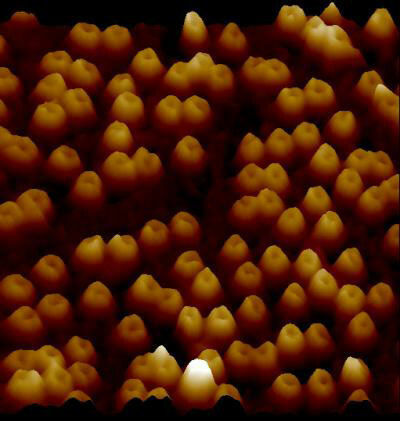 The team used a technique known as atomic force microscopy (AFM) to study the pores. Much like people can use their fingers to read braille, feeling the words rather than seeing them, atomic force microscopes move a minuscule needle across the surface of a sample, measuring its shape and hardness. This method was chosen over other techniques because the pores are too small for optical microscopy and too flexible and mobile for X-ray crystallography. "AFM can reveal far smaller structures than optical microscopes," Dr Hoogenboom explained, "but it's feeling rather than seeing. The trick is to press hard enough to feel the shape and the hardness of the sample, but not so hard that you break it. It's a slow and painstaking process, but it allows us to come up with far better maps of small objects than is possible with other methods - even individual atoms can be observed this way. We used it to successfully probe the membrane that had been peeled away from the nucleus of the frog eggs, to reveal the structure of the pores." As well as explaining the remarkable properties of nuclear pores, and the role they play in higher life forms, the research may also hold promise for the development of new antiviral drugs and better delivery mechanisms for gene therapy. Dr Fassati said: "Certain viruses are able to enter the cell nucleus by tricking the proteins at the centre of nuclear pores into letting them in. Now that nuclear pores are better understood, there may be opportunities to develop drugs that prevent viruses entering in this way. It may also be possible to improve on the design of current mechanisms for delivering gene therapy to better cross the nuclear pores and deliver their therapeutic genes into the nucleus."